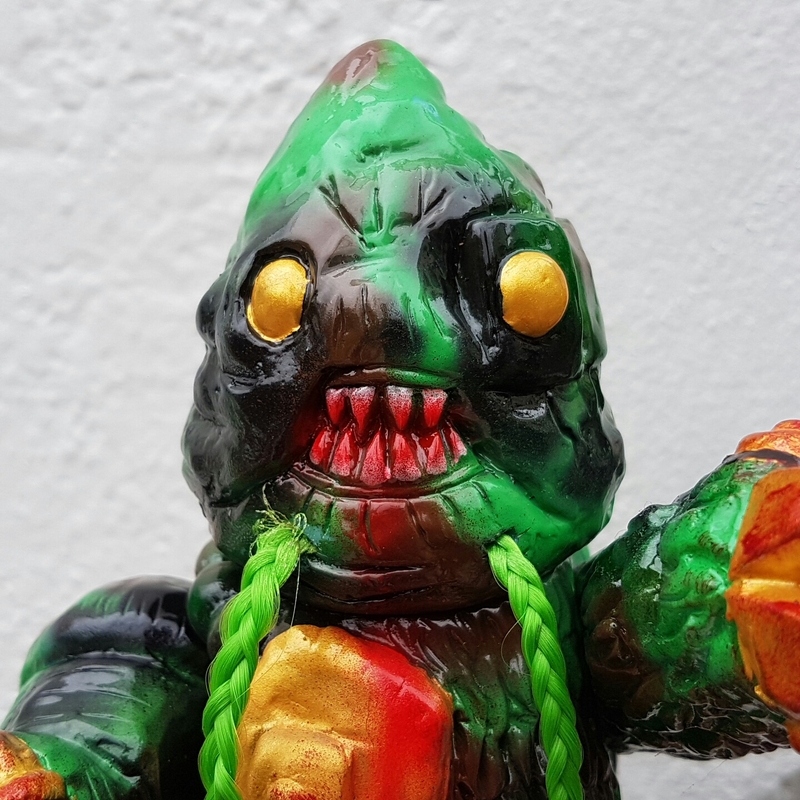 The Slaughter Shark figure is the debut soft vinyl release from ‘Kaiju Light Society’. 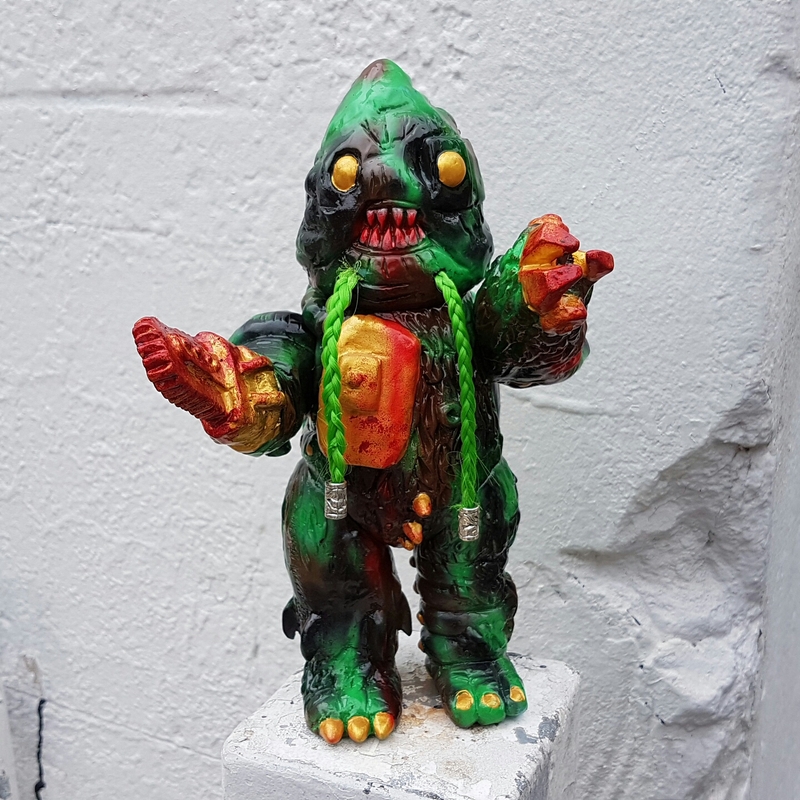 ‘KLS’ is made up of 3 people: Mike from ‘Monsterfoot Creations’ outta Canada + 2 Chinese based artists – Gabriella June and Kear Jun. Interestingly, Gabriella and Kear also work together – with Gabriella acting as Kear’s agent for the figures Kear releases himself. 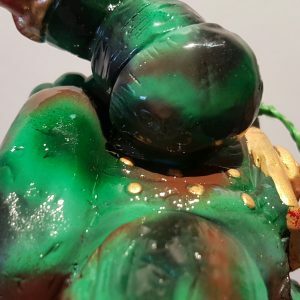 Recently, Gabriella has debuted her very first soft vinyl as well! So all the players involved in ‘KLS’ are well versed in the art toy scene already. A flash in the pan company this is not. The who and how of the figure? Well Mike and Kear worked together on the initial sculpt and design, then Japanese artist ‘NowNowNow’ was bought in to re-do and finish up the design sketches. From there the design and rough sculpt was sent to China, were Kear + Gabriella gave it to a sculptor they know, to re-sculpt and finish. Importantly, as the sculptor was working, Mike, Kear and Gabriella kept an eye on the sculpt’s progress. Making changes and suggestions as it evolved to it’s final form. Finally the figure itself was produced in a Chinese factory that Kear + Gabriella use. So that’s 3 countries and 5 people involved – For 1 figure! Damn. Importantly, both the unknown sculptor and NowNowNow are hired guns – and not part of ‘KLS’ – at least officially. Damn guys this thing is amazing. Unique. Weird. Clunky. Organic. It is monstrous. Imposing. Brutal. And a whole lotta fun. 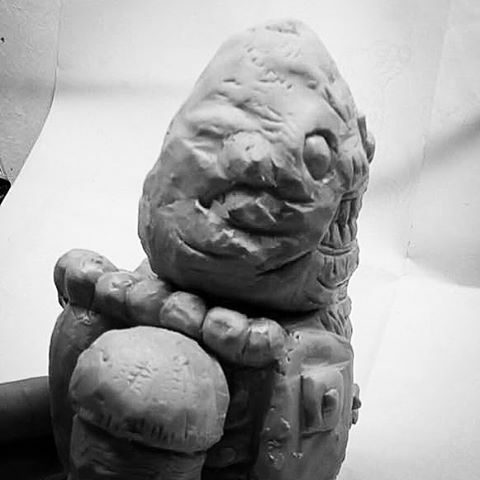 The sculpt is rough. You can clearly tell the human hands behind it, bringing out each detail. A super clean 3D sculpted toy this is not – and we are thankful for that. And the smaller sculpt details? They are amazing – a small pus hole on the chest, the eye cover, spikes on one leg and multiple, varied textures! The figure works great as a chunky blank vinyl, with enough varied details to allow almost limitless custom possibilities. A great kaiju all round! The figure itself is made of blue vinyl for this run. With the vinyl being both made and poured in China. As with most Chinese vinyl we have held – it is slightly denser than it’s Japanese counterpart. The vinyl itself has no apparent flaws such as air bubbles, thin parts or holes. So in that sense it’s perfect. What is of no real matter, but spikes our curiosity is just how damn different Chinese vinyl smells to Japanese… Something you can only really understand directly. Chinese vinyl smells like… well nothing really with a very slight chemical undercurrent. Japanese vinyl, however, smells organic; beautiful even – And if any readers out there know why this difference in smells exists, please do get in touch! 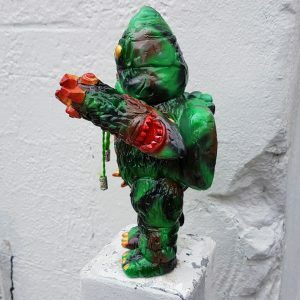 Luke aka 5k1nna hails from Australia and has been working in the toy scene for a few years now. 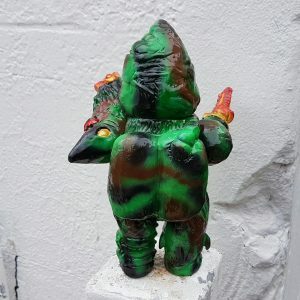 Originally keeping his work to private commissions, he joined the ranks of the soft vinyl community with a bang within the last year or so. Luke painted the figure himself – with his wife Jacinta responsible for the hair braiding. The braids have been done by cutting small holes in the vinyl, which the braids have been inserted through. They are a great addition to the figure – making it look like some rampaging barbarian / biker. The braiding may be a bit rough at parts – but that only adds to the figure’s overall menacing feel. I mean, you can’t imagine a monster as brutal as this taking the time to make sure his braids are perfect each day, can you!?! The paint job itself is beautiful – The figure is painted in a subtle camouflage of green, brown and black. With gold highlights and silver for the teeth. Topping it all off is a blood red splatter effect on the teeth and weapons. We have noticed this red splatter effect being used more and more lately – and it definitely adds a certain sense of brutality to figures when used correctly. Which Luke has done here. We do wish the scuba tank on the rear of the figure was painted gold to match the rest of the scuba gear, but that is a minor issue overall. Importantly, there is enough clear coat over the paint to make it very durable. Perfect for outdoor adventures! Overall this is a figure with great playability! It stands, can be posed and it durable for outside play. 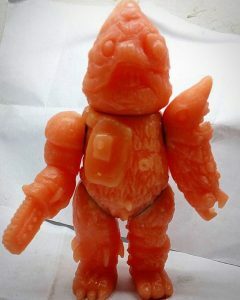 The toy does have 2 small issues – the first was bought to our attention by 5k1nna when he handed the toy over to us. Namely how there is not quite enough room in between the joints on it’s parts, causing rubbing. 5k1nna noted he had to leave small parts unpainted as a result, as every time he would paint the figure, it would rub off when re-assembled. Yes these spots are only at the joins, barely noticeable to the naked eye. But they are there. 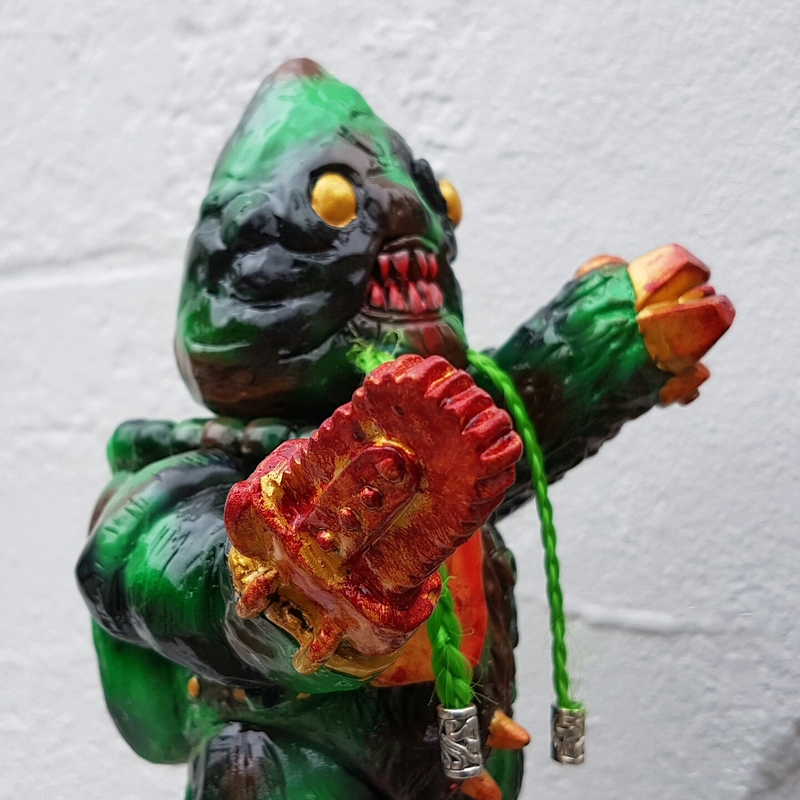 The second issue is similar and was bought to our attention when we began playing with the figure – turning the left arm 360 caused it to rub against the scuba tank, causing paint loss in a very very small area. Due to there not being enough room in between the arm and body at a small point. We must accept responsibility for playing with the figure very aggressively when we first got it – so that is on us. Again it is a very small issue. But ideally one which should not occur. Both these flaws could have been avoided entirely if there was more quality control… Such as thoroughly testing the first pull and/or the wax. This is something we hope ‘KLS’ improves upon with any further figures. Yes the issues are very minor, but they could have been avoided as said, and we feel it is important people are made aware of them. This figure is amazing. Lots of playability a unique sculpt and beautiful custom work by Luke. Yes there are issues with the lack of room in between joints + parts rubbing – BUT they are issues with very minimal impact overall, and no impact on blank versions. Simply put? 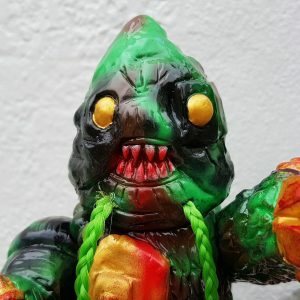 We very much recommend grabbing a Slaughter Shark when there is a run available guys! It’s great to own and play with, and is perfect for custom work as well. And 5k1nna? 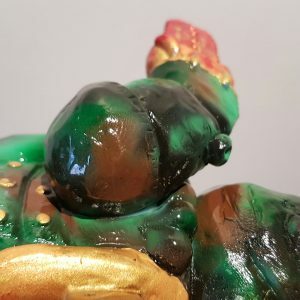 He is a custom artist well worth keeping your eyes on. His work is beautiful and durable. Great execution and perfectly finished up. Clearly a man who understands not just how to paint, but also how to ensure a paint job will last. ‘Kaiju Light Society’ and all the players involved are definitely people we should all be keeping our eyes on! ← What Exactly Are Art Toys And How Can We Critique Them?